Notre Dame Cathedral, one of the world's most famous churches, erupted in flames Monday in Paris, losing its spire but remaining otherwise largely intact after firefighters worked through the night to contain the fire. The commander of the Paris firefighter brigade, Jean-Claude Gallet, said Monday night that the cathedral's main structure and two towers of the cathedral had been saved. Firefighters said they had contained the flames by early morning local time, and the fire was entirely out by midmorning, Gallet confirmed to NPR. Flames leaped through the roof and dark smoke billowed into the sky on Monday afternoon. Observers gasped as the spire fell. The roof collapsed shortly afterward. "Pray," Archbishop of Paris Michel Aupetit wrote. "If you wish, you can ring the bells of your churches to invite prayer." As night fell on Paris and the fire continued to burn, people knelt and sang "Ave Maria" as they watched the blaze. Only one firefighter was reported to be seriously injured. President Emmanuel Macron said, "Notre Dame is our history, our literature, part of our psyche" and pledged that the iconic cathedral will be rebuilt. "Let's be proud, because we built this cathedral more than 800 years ago, we've built it and, throughout the centuries, let it grow and improved it. So I solemnly say tonight: We will rebuild it together." The fire broke out during Holy Week for the world's Roman Catholics. At least four Masses a day take place at the cathedral. Deputy Mayor Emmanuel Gregoire said authorities were trying to save priceless art and relics from the structure's interior, according to The Associated Press. The Paris prosecutor's office says it has opened an investigation into the fire but that initial indications suggest it was started accidentally. 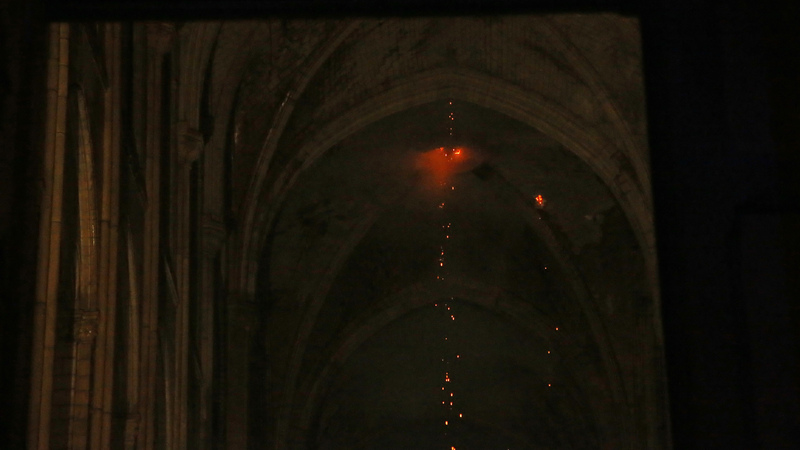 The cathedral closed at 6:45 p.m. local time, and the fire broke out five or six minutes later, France 24 reported. Police in Paris asked people to avoid the area so emergency vehicles could pass. The area was evacuated and a shelter was set up for residents who live near the cathedral. NPR's Eleanor Beardsley was at the scene, standing with Parisians who watched, stunned. "There's kind of a silence here," Beardsley said. "People are not screaming; they're just watching it burn and people are in a state of shock. Outside in the periphery, it's pandemonium in the city. They've stopped the trains from going by here; they're stopping traffic, police everywhere. But in a tighter circle around the cathedral we're just watching it burn." The smoke darkened the sky for miles. Two thousand people were inside when the fire broke out, but none were injured. "They did get some artwork out, but it's going to be cataclysmic damage," Beardsley reported. President Macron canceled an address to the nation that was planned. "Notre-Dame de Paris is in flames," he tweeted. "Emotion of an entire nation. Thinking of all Catholics and all French people. Like all our compatriots, I am sad this evening to see this part of us burn." The structure had been undergoing a $6.8 million renovation project, including work on its spire. Sixteen statues had been removed last week as part of the renovation and were therefore spared from the fire, the AP reports. Promises of massive donations for the cathedral's reconstruction began to pour in within hours. Bernard Arnault, the billionaire chairman and CEO of the luxury goods group LVMH, pledged 200 million euros from his family and his company. Gucci head François-Henri Pinault, another billionaire, said he will donate 100 million euros. Paris Mayor Anne Hidalgo has also pledged 50 million euros from the city and announced a conference to bring together international donors. In the U.S., the Basilica of the National Shrine announced it was accepting donations to help rebuild Notre Dame. Located on the Île de la Cité in the middle of the Seine River, the soaring Gothic structure dates to the 13th century and was completed in the 15th century. The city said that it had closed all entrances to the isle. Notre Dame celebrated its 850th birthday in 2013. It attracts 12 million visitors each year and is the most visited monument in France, ahead of the Eiffel Tower, according to the cathedral. Victor Hugo used its gargoyles and flying buttresses as the setting for his 1831 novel The Hunchback of Notre Dame. Many observers wondered why airplanes were not dropping water on the inferno, as firefighters do to combat forest fires. But the cathedral's urban setting makes such a mission too dangerous: It would involve dropping perhaps 6 tons of water, an unsafe proposition in a densely populated city. The intervention could destroy the cathedral in the effort to save it. France's civil defense agency tweeted that a large water drop could cause the entire structure to collapse and endanger the firefighters below. Caroline Bruzelius, an art historian from Duke University who has studied Notre Dame for years, tells NPR that above the limestone vaults is wood that amounts to a "forest of timber" some 50 or 60 feet high that supports the roof. "This timber is old; it's very dry, and very flammable." The wooden roof was an "accident waiting to happen," said Bruzelius. She offered some sense of the damage the limestone vaults could have sustained: "When it's exposed to fire, stone is damaged. It doesn't actually burn but it loses its surface," she says. "It chips, and it's no longer structurally sound." The cathedral has been damaged before, Bruzelius said, especially after the French Revolution. "The sculpture was torn off the facade, many portals were damaged. The stained glass windows had already partially been changed." She adds: "This is a kind of cataclysmic change way beyond anything we've ever seen." The Vatican issued a statement that "The Holy See has seen with shock and sadness the news of the terrible fire that has ravaged the Cathedral of Notre Dame, symbol of Christianity, in France and in the world." It expressed closeness with French Catholics and the people of Paris and said the Vatican prays for the firefighters. At an event in Minnesota, President Trump called Notre Dame "one of the great treasures of the world."